IsraelAmerica : Paraguay joins the US, Honduras and Guatemala in committing to move its embassy to Israel’s capital. Paraguay joins the US, Honduras and Guatemala in committing to move its embassy to Israel’s capital. 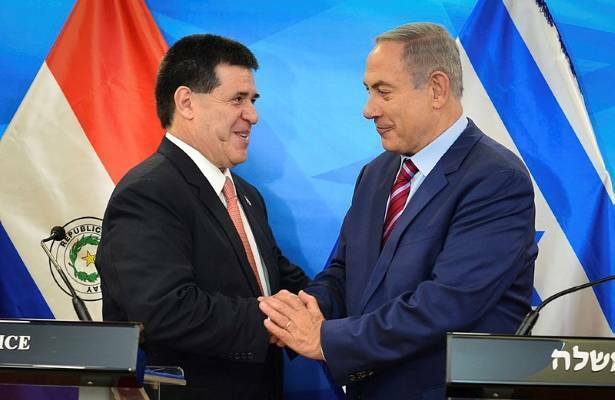 Paraguayan President Horacio Cartes told attendees at a special event marking Israel’s 70th anniversary that his country would relocate its embassy from Tel Aviv to Jerusalem. Cartes said he hoped to perform the relocation before the end of his term in mid-August. In March, Cartes’s government said the country would relocate the embassy if Prime Minister Benjamin Netanyahu came to visit. Last September, Netanyahu became Israel’s first acting prime minister to visit Latin America, though he did not stop in Paraguay. In December, the US officially recognized Jerusalemas the capital of the State of Israel and promised to move the American embassy from Tel Aviv to Jerusalem. Trump has stated that he would not be attending the grand opening in May.